The lyre was conceived and created out of silence. The year was 1926, a time of building up after World War I; the place, Dornach, Switzerland. The men through whom the lyre was realized were Edmund Pracht, a musician, and Lothar Gärtner, a sculptor, both still in their twenties and students of Anthroposophy as taught by the late Rudolf Steiner. Soon the simple chromatic string instrument, which borrowed only its name from the Greek predecessor, came to the notice of teachers, curative educators and therapists, as well as to the ear of musicians and performers seeking a new manifestation of tone. In 1928, at a conference in London, four different models of the lyre were displayed and quickly created considerable interest. 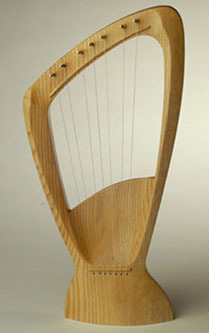 Subsequently, the lyre designed by Lothar Gärtner went into production. Many instruments were built and lyre music was developed. Later on, other designs for the lyre were worked out by a group of musicians and instrument builders under the name of "Choroi." 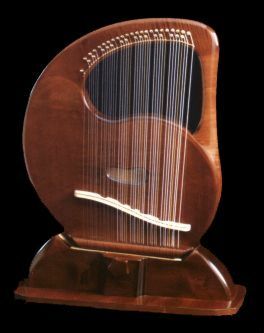 Currently, there there is a wide range of lyres and related instruments, varying in size from a child's "kinderharp" and cantele to the classical soprano and alto lyre for solo and ensemble playing. Largest of all is the Choroi (stand-up) harp. The freeing of the tone from the resonance of the actual instrument is what all types of lyres have in common. With a new awareness, musicians use lyres for researching future elements of melody, harmony and rhythm. The gentle stroke of the string produces a somewhat modest note that grows at once in tonal intensity within the space of the room or hall where it is played. This acoustic property has been employed by Choroi for developing other instruments in the woodwind and percussion sector. A completely transformed ensemble sound is created when the new instruments play together.